The key for this dish is simple – do not overcook! We want the egg to be creamy and melt in your month, not dry and rubbery. 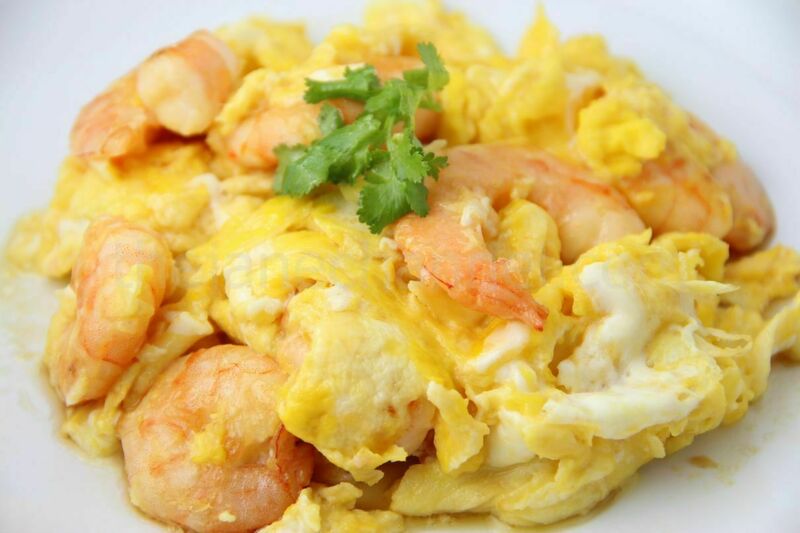 After the shrimps turn pink, you want to lower the heat and pour the eggs on top. Turn up the heat quickly, and once the curds start to form on the side (see picture on the right below), stir quickly. Continue to stir almost constantly until the eggs are just done. There should still be a small amount of liquid egg when you transfer it to your serving dish – the egg will continue for a bit more by itself from the heat. Marinate the shrimps with one tablespoon of egg white, salt and corn starch. Heat oil in a skillet over medium high heat. Cook shrimps on both sides until opaque. Turn the heat to low. Add eggs, turn the heat back to high, and fold eggs over themselves. Remove the skillet from heat when eggs are just cooked.